Beyonce was just nominated for favourite female artist at the Kids' Choice Awards and just like magic, everyone's favourite was back to showing us what she's made of in stunning and stylish new photos on Instagram. The wife of rapper Jay Z flaunted her toned legs and flat tummy just eight months after welcoming twins Rumi and Sir. She already has daughter Blue Ivy, aged six. The images were taken on the same day as last week's NBA All-Star Game in Los Angeles but this is the first time fans got a good look at her outfit. 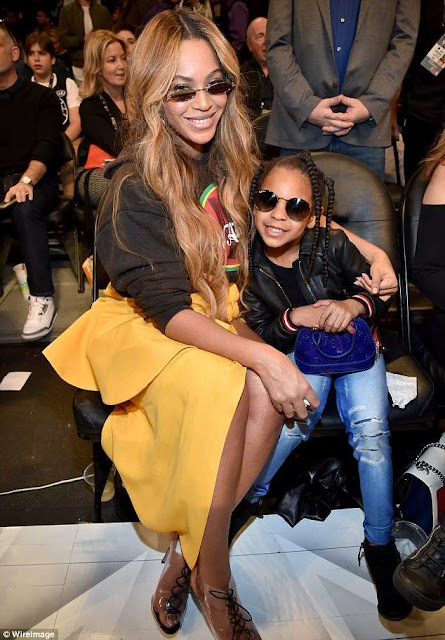 Beyonce wore a yellow skirt that opened in front with slits, adding a JW Anderson hoodie. She added a hat that said 'No Pictures'. She's the ultimate style icon and even when she's sitting courtside watching basketball, Beyonce brings her top fashion game. Queen Bey was spotted in a statement skirt by Jacquemus, which she teamed with a vintage hoodie and lace-up PVC boots by Gianvito Rossi. Of course, it was her skirt that really took centre stage. The peplum ruffle creates an edgy and fashion-forward feel, while the draped effect is uber flattering.